Equipment: satellite TV; electric heating. Furnishing: with much wood, well-kept, homely. Please note: Non-smoking house. detached house, 6 people, 4 room/s, 3 bedroom/s, 1 bathroom/s, approx. 60 m², 1 floor/s, renovated 2010. Bedroom 1: double bed (1.50 m wide, 2.00 m long). Bedroom 2: bed for 3 persons (1.20 m wide, 2.00 m long). Bedroom 3: bed for 3 persons (1.20 m wide, 2.00 m long). Dining area: in the living room. Important information: maximum occupancy 6 people. Kitchen: Kitchen/ cooking equipment: 4 electric plates, oven, dish-washer, refrigerator, coffee machine, freezer approx. 50 litre. in the living room. Living room: furniture suite, wood-burning stove, exit to terrace. Sanitary 2: TC2: mulch toilet. Access/parking: Access to the house via footpath approx. 20 m. parking near the house approx. 20 m.
Estate: (private use): approx. 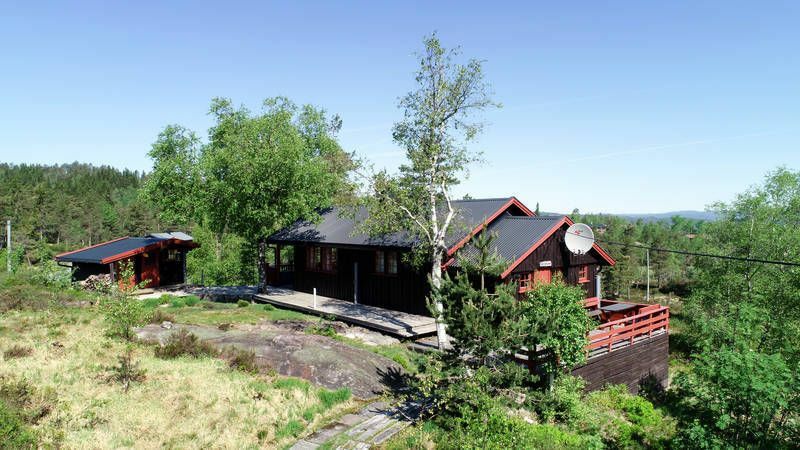 1000 m², open plot, trees, natural surroundings, rocky. Fishing: moderate fishing possibilities, in the river Otra in approx. 6 km. Outdoor facilities: (private use): terrace, further terrace, furnishing provided, transportable barbecue. Arrival: Airport Kristiansand Kjevik in approx. 60 km. Ferry port Kristiansand in approx. 59 km. Beach/waters: Lake (bathing possibility) in approx. 500 m (Grastjørn). River in approx. 6 km (Otra). Next village/town: Arendal in approx. 98 km. Center Moisund in approx. 8 km. Kristiansand in approx. 59 km. Shopping: Next shopping possibility (Moisund) in approx. 8 km. Next supermarket (Evje) in approx. 16 km.